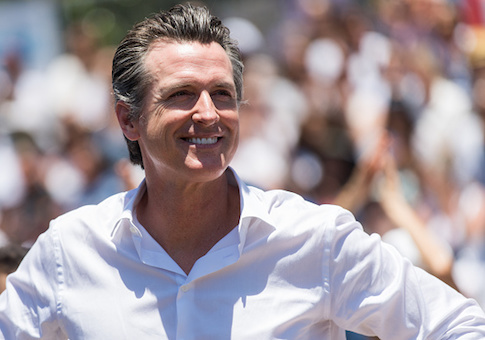 Gavin Newsom, who is running to succeed California Gov. Jerry Brown, is moving forward with major Hollywood fundraiser set for Thursday just days after the largest wildfire in California's history took the life of another firefighter. News of the star-studded fundraiser on the Universal production lot broke last week while three of the biggest wildfires recorded in the state's history raged—one near Mount Shasta, another near Yosemite National Park—with a total of five burning across the state. In the last few days, firefighters have largely contained the biggest fires, but the communities impacted are just beginning to recover from the devastation that includes 10 deaths across the state, more than 1,000 homes destroyed, and 820,000 acres incinerated. On Monday, a firefighter from Utah died working on the massive Mendocino Complex blaze, which was 64 percent contained as of Monday morning. He was one of six firefighters or utility workers who have died in fires in the last month and a half. John Cox, a wealthy businessman Republican candidate for governor, last week slammed Newsom for moving forward with the Hollywood fundraiser as hundreds of thousands of people were fleeing their homes. "Meanwhile as much of CA burns, millions are forgotten by, @GavinNewsom & his champagne and cheese crowd," Cox tweeted, along with a link to the Variety article on the event. "We don't have to accept it anymore." The Newsom campaign did not respond to respond to a request for comment by the Washington Free Beacon on the timing of the fundraising. Deadline.com quoted an industry insider who said the fundraiser costs $1,000 to $29,200 a ticket and will be held at the Grill at Universal Studios. The event's host committee includes Steven Spielberg, Jeffrey Katzenberg and wife Marilyn, as well as NBCUniversal chairman Ron Meyer, Universal Entertainment boss Jeff Shell and wife Laura Shell, and Donna Langley, another high-powered chairman of Universal Pictures, as well as Ramin Shamshiri and his sister Pamela Shamshiri, who co-founded Studio Shamshiri in early 2016. According to Variety, early last year before Kevin Spacey's sexual misconduct scandal cost him his career, Langley and Shamshiri purchased Spacey's longtime estate for $11 million in an off-market deal. Newsom is planning to move forward with the Hollywood event even though he has an overwhelming fundraising and polling advantage against Cox, his long-shot GOP opponent. As of early August, he has more than $11 million in his campaign war chest while Cox has $1.5 million, according to campaign finance records. Cox has donated $5.5 million to his campaign and could easily cut more checks. According to a recent poll by the Public Policy Institute of California, Newsom has a 24 percent point polling advantage over Cox.